There’s another set of photos from our last trip to Mt. 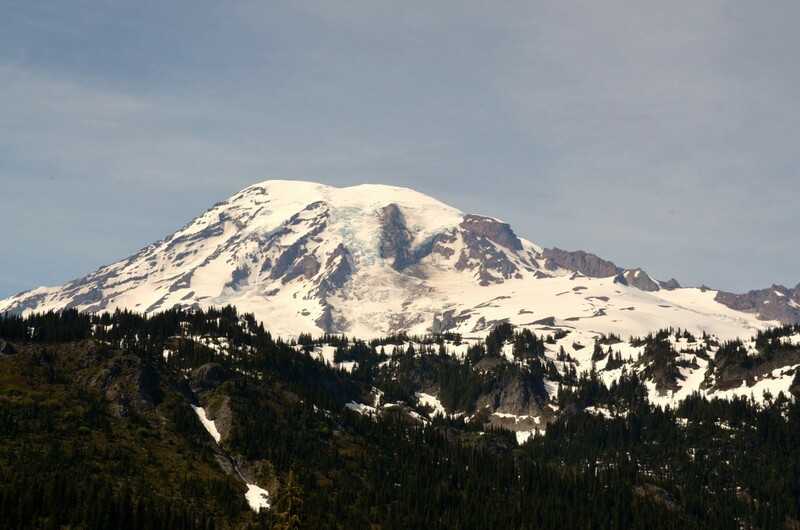 Rainier that I keep meaning to share – our hike to Comet Falls. 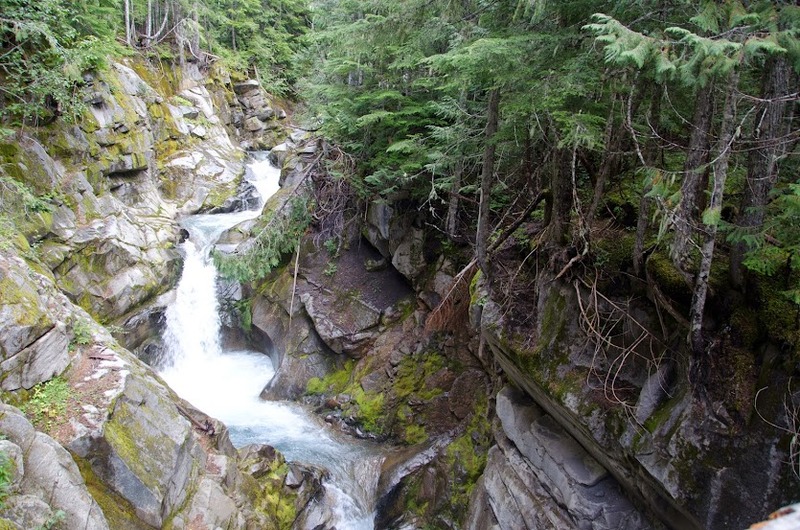 It’s a four-mile round trip trek up the side of a mountain that takes you to the area’s highest waterfall, which drops over three hundred feet (maybe even over four hundred – depends on which source you consult). After we’d gazed in awe at the falls for a little while, Evan surprised me on the way down by reciting a Hebrew blessing, which he said was meant for times when you’d seen an amazing natural sight like this one. 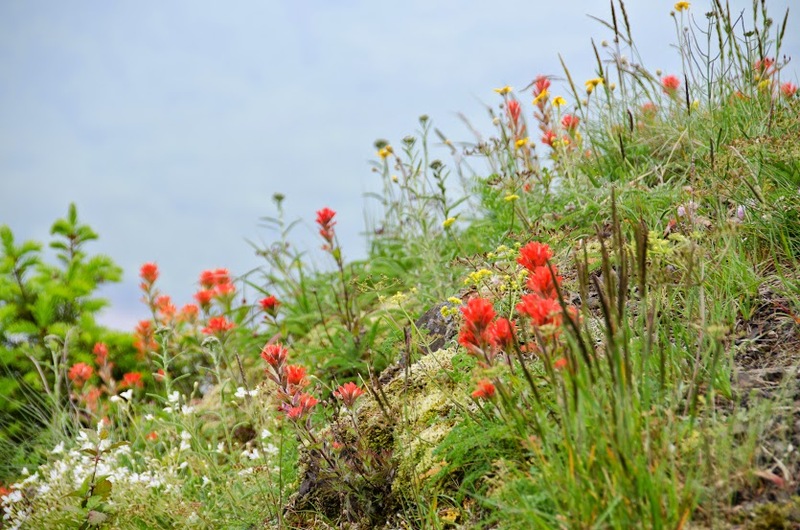 I loved the idea that Judaism has a blessing specifically for beautiful things in nature, but when we looked it up later we discovered he’d slightly misremembered things: Shehecheyanu is actually a blessing for the start of something new. Shehecheyanu v’key’yemanu, v’hi’gi’anu laz’man ha’zeh. Who has kept us alive, and sustained us, and enabled us to reach this moment. But, it’s still appropriate. 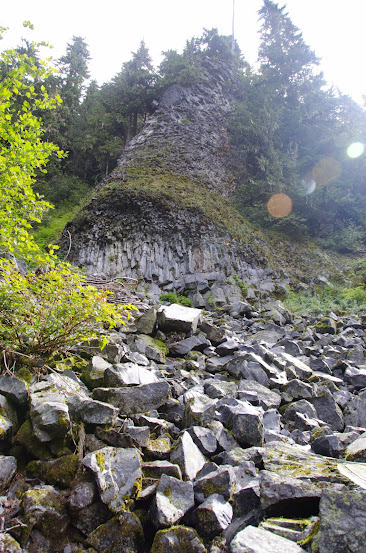 When I left my job in Oregon in June to move to Walla Walla, I was purposefully vague on this blog about the reasons why; this blog is supposed to about natural history and enjoying the outdoors, not my personal life, and the move had nothing to do with my environmental education career. Still, I guess at this point there’s no reason not to give a brief life update. I moved to Walla Walla because Evan is here, and two weeks ago we made our engagement official. Since I couldn’t make an environmental education job magically materialize here, I’m spending the next year as an AmeriCorps member, getting to know my new community while continuing to work with youth. So, Shehecheyanu, here’s to the start of something new. One day this past week I found myself on top of Mount Howard, just south of Joseph, Oregon. 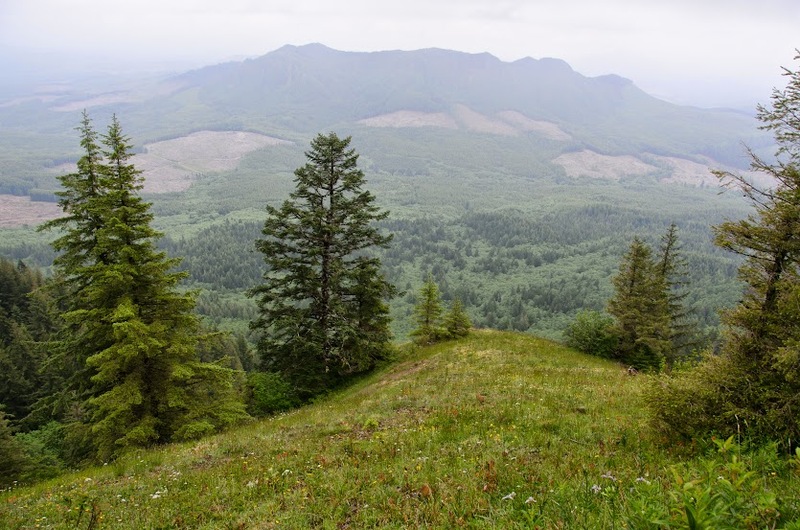 (It’s a popular tourist area, known as the “Alps of Oregon,” and an aerial tramway takes tourists up to the summit of this particular mountain.) 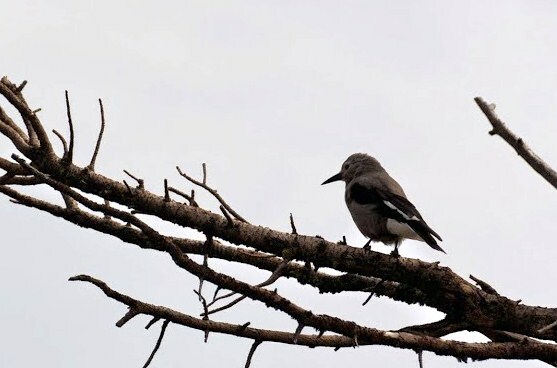 To my delight, one of my favorite western birds was making a racket in the fir trees: the Clark’s Nutcracker, a member of the jay family. Thanks as always for taking photos, Evan. 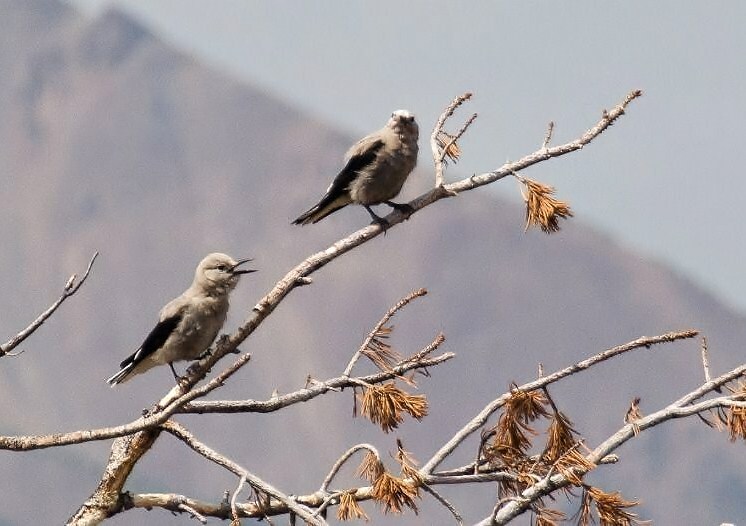 I’ve written before about how, in some places in the west, it seems almost possible to estimate one’s altitude based on which jay species are present. 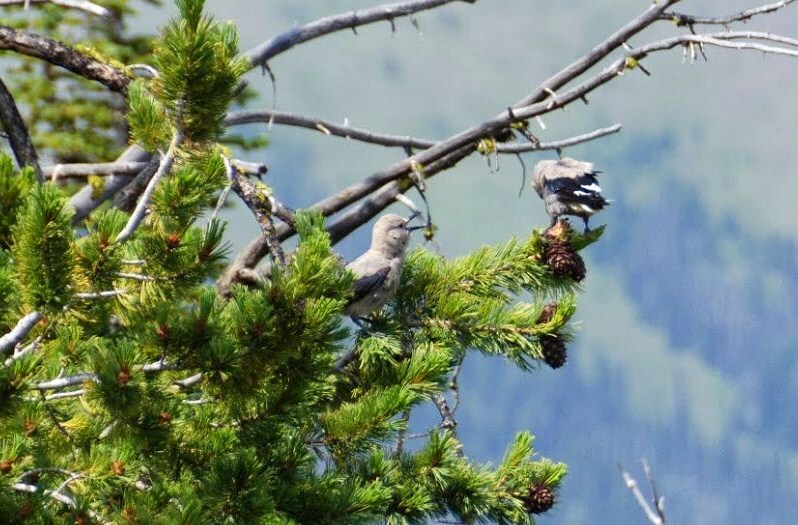 You have to get up into the mountains before you’ll see any Clark’s Nutcrackers, but once you get into the right habitat, they’re pretty common. The birds were making quite a racket. Jays often do, but there was something specific going on in this case: as I watched, I realized I was seeing a pair of birds, one quietly going about its business of foraging among the conifer cones and a second one following it around making piteous keening noises. 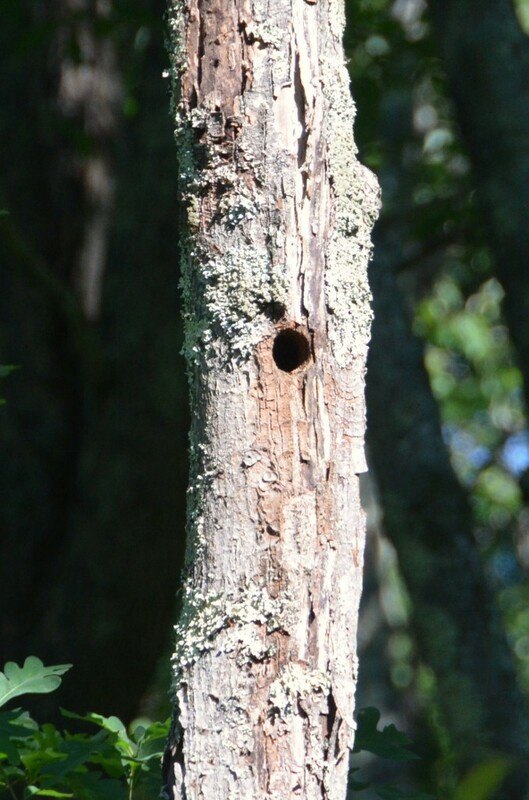 I’m 95% sure it was a recently-fledged bird, following its parent around and begging. Stumbling across interesting birds is always cool, and it’s even better when you get to see an interesting behavior like this. Part of the fun of living out west is that even some of the fairly common birds of the area (like Black-billed Magpies and Lazuli Buntings and Red-breasted Sapsuckers and what have you) still seem novel. Happy birding! Last week I was in the woods of eastern Pennsylvania, on a visit over the holiday weekend. It’s always fun to get a chance to see and hear the eastern birds I grew up with that we don’t have out west – Blue Jays, Eastern Towhees, Eastern Phoebes, and all the rest. 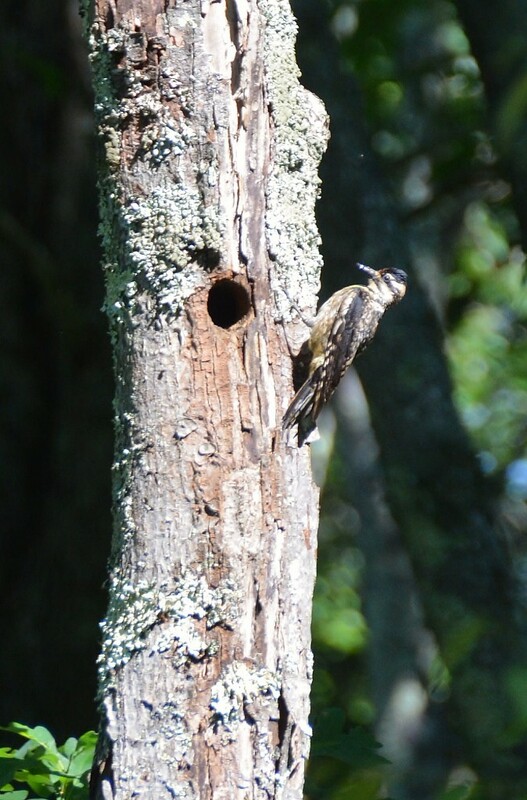 This time, the highlight was spotting a Yellow-bellied Sapsucker nest just twenty feet or so off a trail. It was Mom (without the extensive red forehead and chin) who kept coming and going with food, posing for photos. I’m normally not great at finding nests (though I seem to be having more luck than usual this year), so this was a treat. 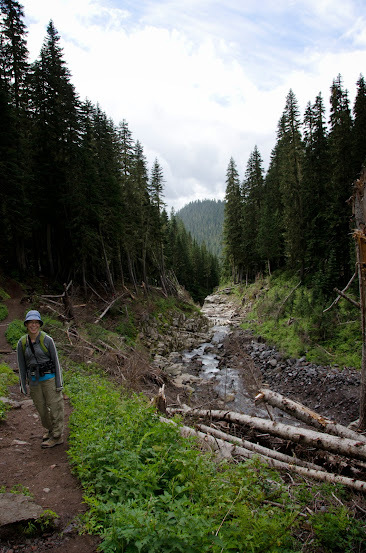 Now I’m back home in Walla Walla, and with high temperatures climbing into the triple digits this weekend, I’m not planning on hiking again for a little while! 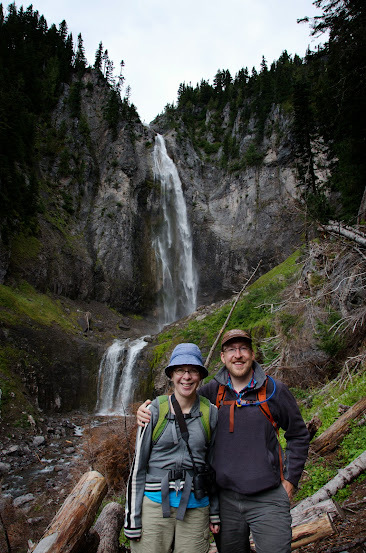 We visited Mount Rainier National Park over the weekend, and after driving up to the Paradise visitor center, opted for a short hike to Snow Lake. 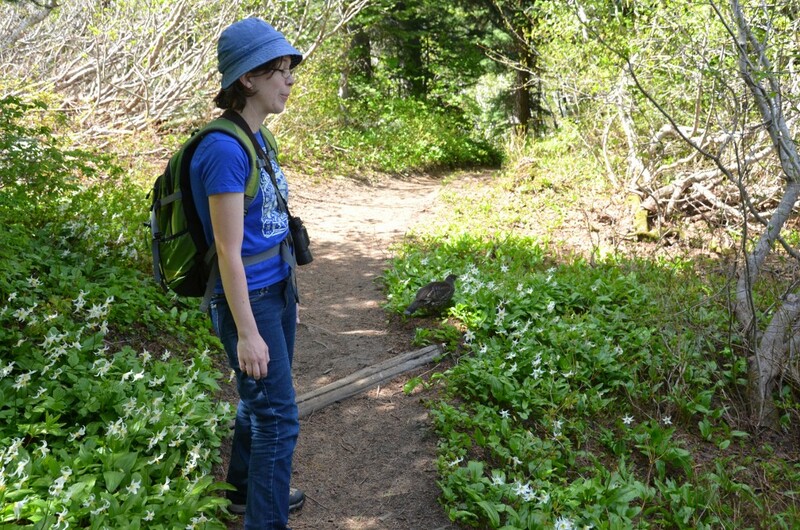 The trail was still partially snow-covered but was absolutely beautiful, thick with blooming Avalanche Lilies and providing stunning views of the mountain (I’d been to the park once before, but on an overcast day when the peak was lost in clouds). 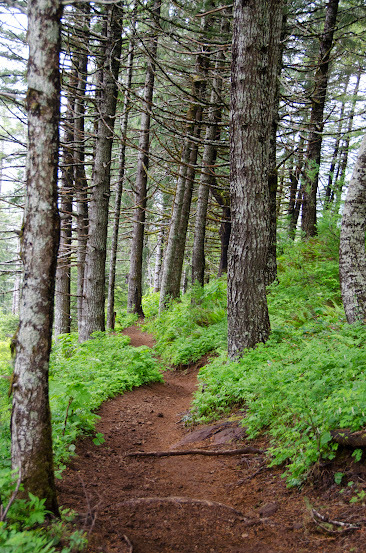 On the way down, a grouse unexpectedly walked out onto the trail in front of us. 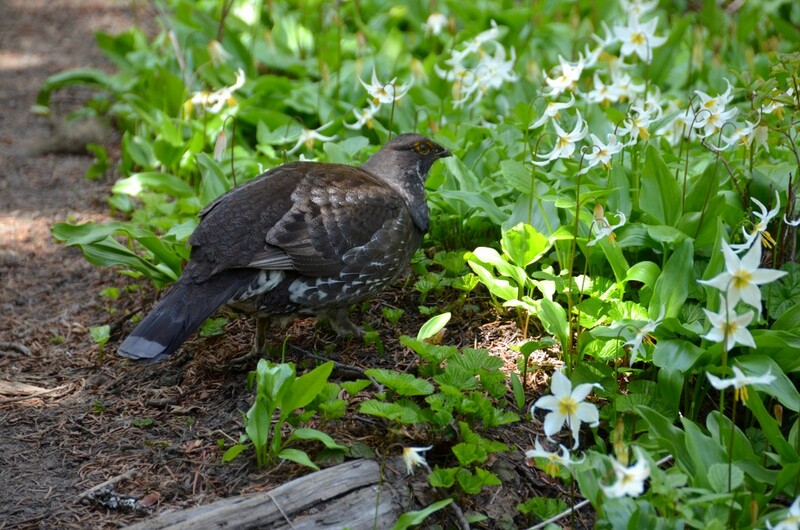 Unlike Ruffed Grouse, which in my experience flush as soon as they hear you coming so that all you ever see is their tails as they fly away, this male Sooty Grouse (a lifer for me) was remarkably unconcerned by our presence as he pecked at the vegetation. 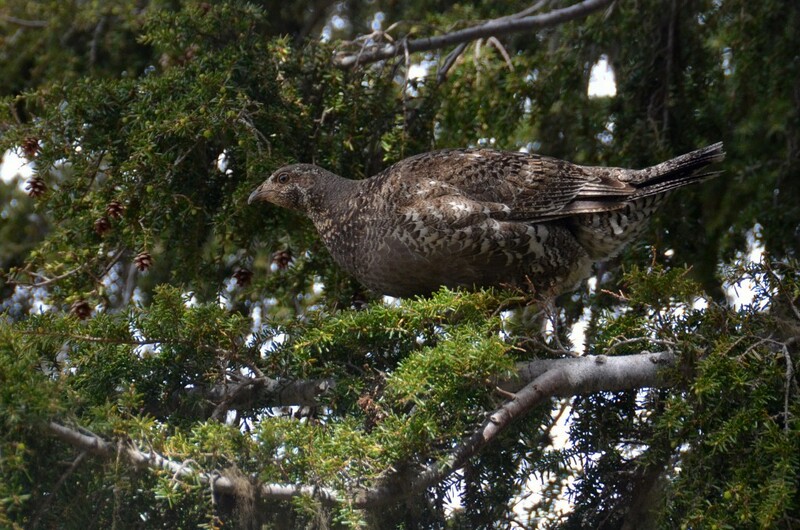 We also got to see a female when one flew across the road and perched in a hemlock tree by the trailhead, where she appeared to be eating the needles. All in all a great bird to conclude two weekend of travel on the west side with! Photos (once again) by Evan Heisman. As we were on our way down, it was getting late enough that most of the day hikers were gone and the birds were starting to sing. One song in particular caught my attention: it had the sonorous, flutelike quality of a thrush, and the same pauses between phrases, but unlike any other thrush song I’d heard, each phrase was just a single, drawn-out note. I wish, I wish, I wish there was a way to embed Macaulay Library sound clips on WordPress, but there’s not, so you’ll just have to click here to hear it for yourself. 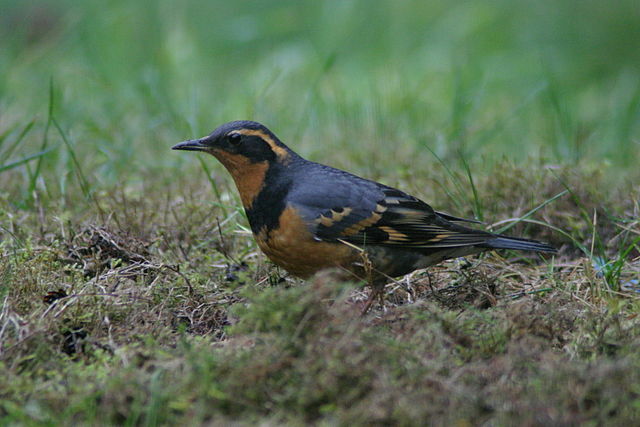 By process of elimination, I deduced (correctly) that this was the song of the Varied Thrush, a robin cousin found only in the forests of the coastal Pacific Northwest. Mixed in was this was the beautiful upward-spiraling song of a Swainson’s Thrush. Click here to hear that one. Living in the Cascades’ rain shadow as we do, sometimes it is very, very nice to spend a weekend on the coastal side of the mountains. It was even worth getting rained on while we were breaking down our campsite the next morning! 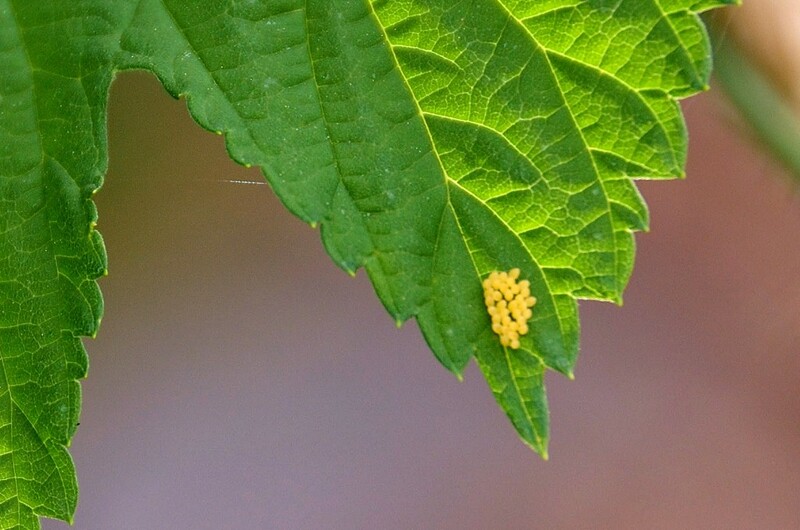 Insect eggs! But what sort of insect eggs? Something that would munch on the hop leaves and damage the plants? Luckily it wasn’t hard to figure out the answer, because the culprit was still nearby. This was last week. 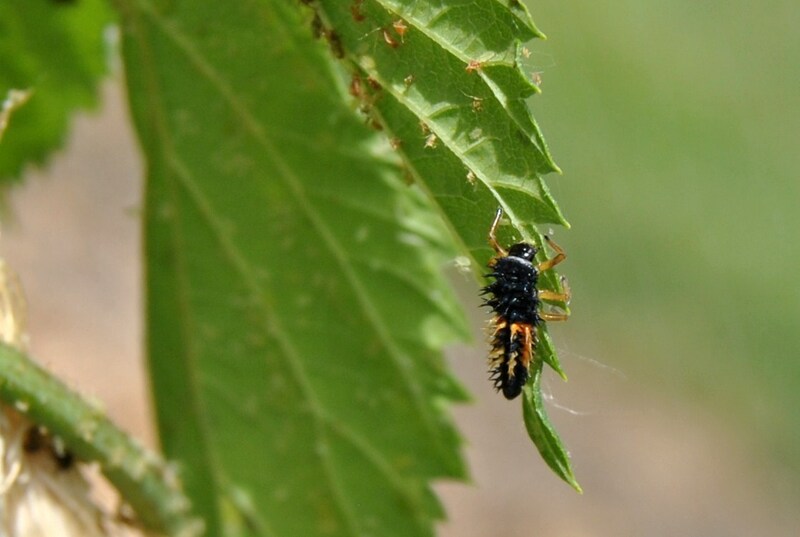 When I checked back this morning, the eggs had hatched and the plant was crawling with tiny, spiky ladybug larvae. And also with aphids. But at least there are baby ladybugs around to eat the aphids, right? I’m not sure whether these are a native ladybug species or an Asian one; I know you can tell by the face pattern, but the photo of the adult ladybug isn’t clear enough for me to be sure. In any case, it’s fun to be able to watch their life cycle. 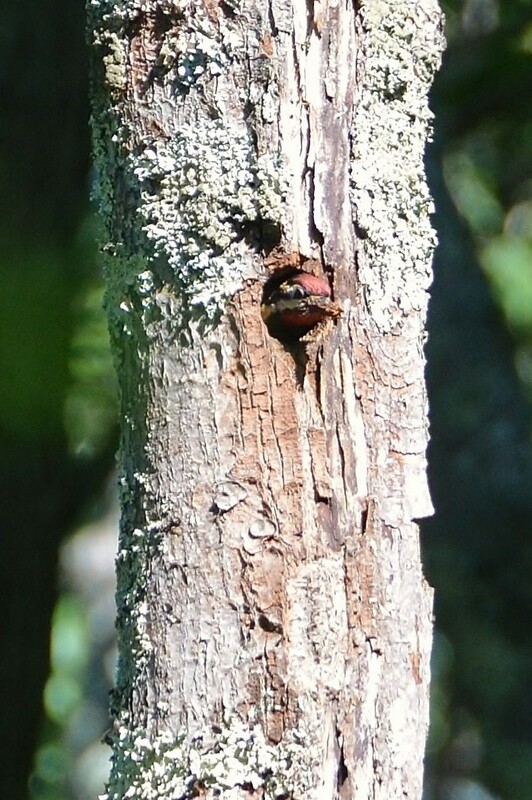 I’ll have to check back and see if I can find pupae later on. 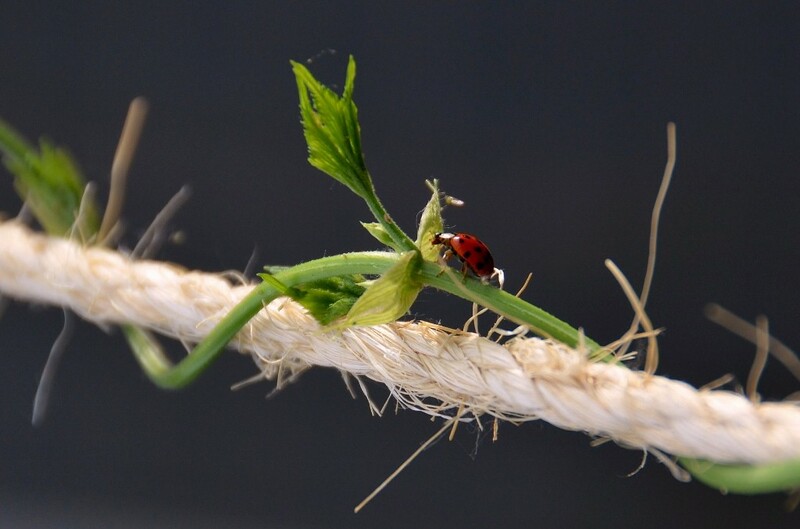 UPDATE: I did keep checking but apparently missed the pupae – after forgetting about it for several days, I took a look at the plant and there were no remaining ladybugs (at any stage of their life cycle) to be seen. Oh well.